Rex Hwang, a registered Patent Attorney in JMBM's Litigation group, has significant experience litigating complex patent, trademark, copyright and trade secret disputes. Rex’s practice covers all aspects of intellectual property law, including intellectual property litigation, patent and trademark prosecution, licensing negotiation, AIA proceedings such as IPRs, CBMs and PGRs, and counseling relating to intellectual property procurement and development. Rex has handled matters covering a wide range of technologies and products including mobile communication devices, flash memory devices, LED lights, semiconductors, medical devices, consumer chemical products, and computer hardware and software. Rex has represented clients ranging from Fortune 500 companies to smaller business including LG, VIZIO, British Broadcasting Corp., SHFL entertainment, Bally Gaming, BEA Systems, Inc., Oracle, Fuji Xerox and others. Rex has served as litigation counsel in a variety of intellectual property litigation matters at the federal district court and appellate court levels, and before the United States Patent and Trademark Office in both interference and post-grant review proceedings. While in law school, Rex was the managing editor of the Kansas Journal of Public Policy and was selected to participate regionally in the Saul Lefkowitz Moot Court Competition. He is admitted to the United States Supreme Court, the United States Court of Appeals for the Federal Circuit, U.S. District Courts for the Central, Northern and Southern district of California, and permanently admitted to practice in U.S. District Courts for the Eastern District of Texas. Rex is also registered to practice before the U.S. Patent and Trademark Office. Rex is also an active member of both the legal and local community. 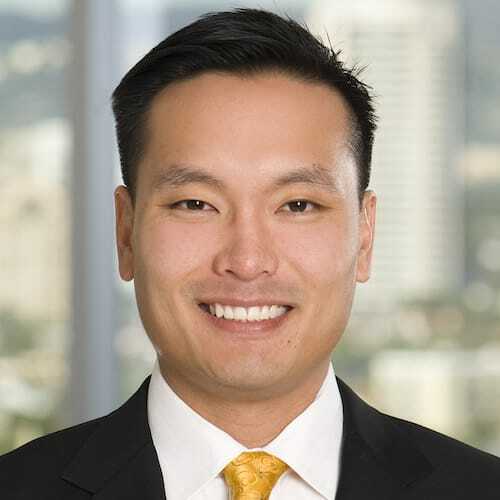 He is a member of the Board of Governors for the Los Angeles Korean American Bar Association, the Director of Administration for NAAAP-LA, and the Big 12 LA Liaison for the KU Alumni Association. He is also an active member of the Los Angeles Intellectual Property Association and the Judge Paul R. Michel Intellectual Property American Inn of Court. Rex also pens the “Federal Circuit Report” column in New Matter, which is the official publication of the Intellectual Property Section for the State Bar of California. Successfully obtained summary judgment of non-infringement for VIZIO, Inc. involving patent claims regarding “de-interlacing” technology used in certain VIZIO televisions sold in the U.S. Represented major manufacturer of mobile devices in action involving user interface technology. Case was successfully stayed pending reexamination of asserted patents, in which currently all patent claims stand rejected. Represented major electronics manufacturer of mobile devices in action involving microprocessor technology resulting in favorable settlement for client. Successfully handled appeal before the United States Court of Appeals for the Federal Circuit where district court’s patent invalidity determination of three utility lighter patents was affirmed. Represented owner of patents directed to mobile network technology against major computer manufacturers resulting in favorable settlements after Markman hearing. Successfully invalidated patent claims involving flash memory technology as lacking written description support in a patent interference action before the Board of Patent Appeals and Interferences. Represented nail polish distributor in litigation involving lacquer composition patent resulting in favorable settlement for client. Represented major distributor of various seafood products in trademark infringement litigation resulting in favorable settlement for client. Successfully obtained summary judgment invalidating five design patents covering and dismissing related trade dress claims for automobile parts, directly leading to a consent judgment invalidating two additional patents and a six figure award of damages for client’s counterclaim. Represented major electronics manufacturer of mobile devices in various patent licensing negotiations involving digital image processing, digital music player, mobile telecommunications and Internet protocol television technologies. New Matter, Intellectual Property Law Section of California Lawyers Association Publication: E.I. Dupont De Nemours & Co. v. Synvina C.V.